activities and learning opportunities for each age group. Academically, we utilize the same curriculum that is offered at our other Wishing Well Preschools so rest assured that we are not just “baby-sitting” your children. We feel obligated to make the most of your child’s day, and do so, by following a few basic steps as outlined below. of contemporary play equipment and activity centers. Qualified and dedicated staff. Our staff has been carefully selected for their specific educational degrees or early childhood training, previous teaching background, and their sensitivity to the individual needs of young children. They are truly professionals because of their standards of performance and commitment to education and children. Your child's day provides a balanced schedule of activities, individual and group participation, an educational program, active and quiet play, and times for meals, snacks and rest. 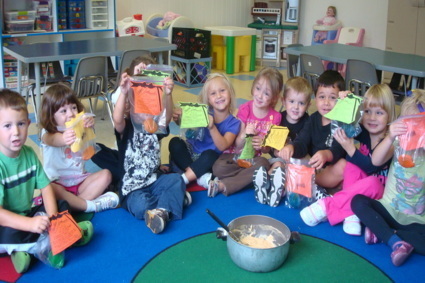 A qualified cook prepares well balanced and nutritious lunches and snacks for the children. We also keep things interesting by having in-house field trips throughout the year. These events include many special visitors such as a magician, fire department, etc. all designed to entertain your children. We are interested in the process of learning rather than the product of training. Our program focuses on kindergarten preparation, with a developmental readiness curriculum that is appropriate to the child's age and development to promote success. Our educational curriculum stimulates creativity, facilitates play and builds confidence, yet allows for maximum flexibility with children of diverse developmental levels. For most children, this is their first educational experience and it is imperative that it be enjoyable as well as enriching. Child / Teacher ratio for Three Year olds is 9:1 with a maximum class size of 18. Child / Teacher ratio for Four Year olds is 10:1 with a maximum class size of 20. A typical day for your 3 or 4 year old.